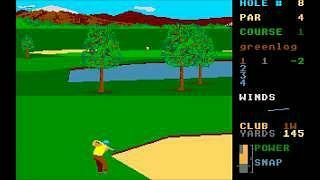 Today's golf simulations are so realistic that you almost feel that your playing on a real golf course. 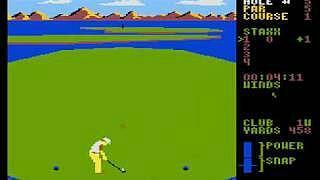 Back in the 80s, of course, golfing games were far from realistic in terms of the graphics. However, the basic principles of selecting the right club and judging the wind direction were very much in place in Leaderboard, and the animation of the golfer was particularly good. 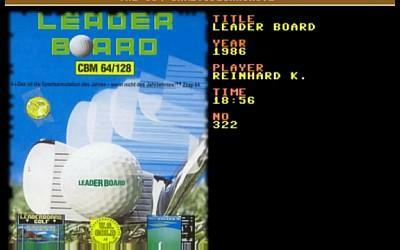 Leaderboard was the first in a series of 3D Golf sims released for the 8-bit and 16-bit home computers of the day. In 1986, the game looked stunning, and received rave reviews from many computer and gaming magazines - Zzap 64 magazine gave it a gold award and a rating of 97%. First published by Access Software in 1986, the sports sim became hugely popular and was the third best-selling Commodore game of 1987. It's creators (and co-founders of Access Software) were brothers Bruce and Roger Carver who did a fine job with the development of the multi-coloured, calculated graphics. In fact, the duo were once described as the "Gods of gaming" by PC Gamer. The control system used was actually very influential and has been widely copied ever since. Moving your joystick left and right determined the direction of your stroke and the length of time you held down the fire button determined the power with which you hit the ball, and this was indicated by a power meter bar. Another press of the fire button allowed you to take your shot. There were three modes; Novice, Amateur and Professional with the wind playing a bigger part in the latter two modes. 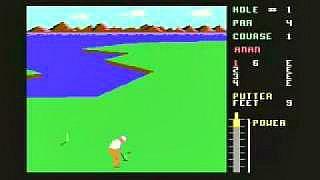 The accuracy of the game compared to playing real golf was exceptional considering the limited capabilities of the 8-bit machines, and the Carver brothers had really made the most of the miniscule RAM memory that was available. An expansion pack called Leaderboard Tournament (containing four brand new courses) was also released during 1986 and came on disks. The ZX Spectrum version looked nothing like the screenshots shown here on the front of the cassette case, but, thankfully, the conversion lost little of the playability of other versions. 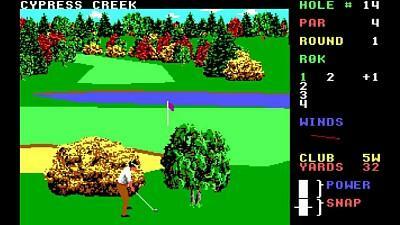 In 1987 the second version of the game, Leaderboard Executive, was released and featured new landscaping such as bunkers and trees, although the enhanced graphics weren't enough to convince reviewers to rate the game highly, and it was considered to be the worst of the three games. 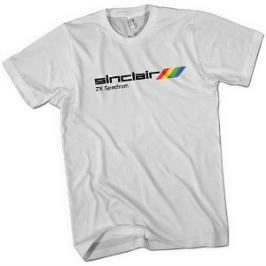 The third and final game, World Class Leaderboard, was much more highly rated and received 9/10 by Your Sinclair.